The HoM awards went to Vic Verecondi, & Eddie Winslow & Stuart Pitches. Congratulations to them. They will receive technical running shirts from HoM sponsor UP & RUNNING. Eddie Winslow reports Stuart Pitches and I, racing with the crew of White Cloud, were 2nd in this year�s Three Peaks Yacht Race. We finished just before midnight on Tuesday night just 90 minutes behind the winners after three and a half days racing and 45 minutes ahead of third place. Jim & Lyn report on ... an English fellrunning Championship counter, 8.5miles, 2.530ft of climb, starting and finishing at Rothay Park, Ambleside. Four ckeckpoints at Loughrigg, Silver Howe, returning to Loughrigg and finally at Lily Tarn. Checkpoints had to be listed in that order with routes in between were down to individuals which made some interesting route choices and discussions after the race. Met an interesting guy at the end, a Vet 70 who could run like the wind and had put in a fantastic time. Had a good chat about his fell/trail racing adventures. So I asked him what his formula was. His response was very very simple... �Luck� he stated emphatically. Pretty basic hey... So I�ll take that comment/thought when I next get a PB or feel happy about a race or good training session. Tom Adams retained his title winning the event for a second year in a row shaving over 40 seconds off his time from last year (same again next year and he'll be close to the record, 16:01). If you enjoyed that and fancy a similar race, or missed it and really fancy running up this super hill, come to our Addingham Gala fell race on Saturday 9th July. Geoff Howard repeated last year's Bronze medal success in V65, with a time of 19:30; and fell team member Tracey Greenway won a Gold. Well done both. 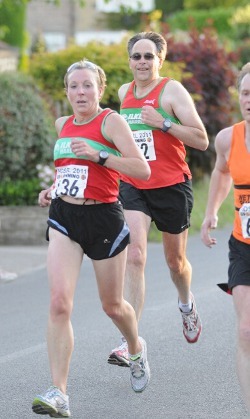 New member Rhiannon Turner reports ... did the run in 52:20, really pleased, big improvement on the last time I did it. Saw a few other Ilkley Harriers along the way who said hello - was a good atmosphere. Next goal a sub 50 time! Nick Pearce reports ... a classic fell race over a 4 mile course including a river crossing and near vertical climb at the start; and vertiginous descent, river crossing and wall jump at the finish, with a 1,500 feet of ascent in total. The race was won by Karl Gray of Calder Valley in 34.43. Ilkley Harries were Nick Pearce 23rd (2nd V50) in 41.55; Michael Pearce 43rd in 45.28; and Sue Morley 100th (1st LV50) in 1.00.12. Steve Turland reports ...Now in its 4th year, this one is becoming a classic. 13m and 7,000ft from Langdale taking in Bow Fell, Esk Pike, Great End, both Scafells across upper Eskdale then back over Pike Blisco into Langdale. With the clag down for most of the way, it made for some interesting navigation!. 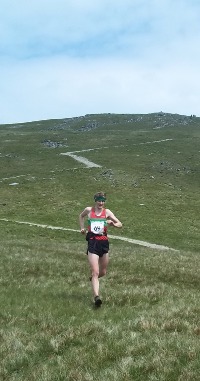 Race was won by Mark Palmer of Mynydd Du. I finished 11th in 3hr 27 and Roy Ruddle was the other Harrier - still waiting for results to confirm time/position. People are doing ParkRuns all over! Gemma Carpenter was 59th in 27:33 at Bradford Lister Park. Ken Souyave was 23rd in 19:51 at Leeds Hyde Park. Junior Harrier Lucy Haines was 54th in 22:01 and Sarah Haines was 90th in 24:06 at the Edinburgh event. And Junior Harrier Holly Park was 32nd in 32:12 at the Conkers (Loughborough) ParkRun. Ilkley Harriers beat Bingley Harriers for the fourth year in succession in the Mob Match at Bingley Harriers' St Ives Trail Race. A stupendous turnout of 47 Harriers dominated the field of 115 starters, vastly outnumbering Bingley's 20 runners. Bingley scored 1643 points under the age/gender handicap system, Ilkley's best 20 scores totalled 1831 points for a clear win, yet again. Thank you all for turning out and supporting the Club so well. 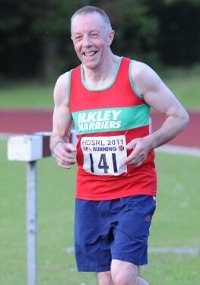 This was also a Ilkley Harriers Race League event. Photo: just some of the Harriers at the event: see woodentops.org.uk for more! Vic Verecondi reports ... What a great day out ... it seems from the big gathering on Sunday night at the Taps that everybody in the 3 teams enjoyed themselves ... Well what can I say it was a pleasure organising it all and I think it�d be best left if individuals/pairs submitted their own stories ...From what I heard there were many ... Thanks to all who participated and a big thank you to Alison Bennett and Abigail Bailey for there assistance in getting other teams going. Nick Pearce reports ... Four harriers travelled to Barnoldswick for the fortieth running of the Weets fell race. I didn't realise that the race no longer starts at the Rolls Royce sports club, but near Letcliffe park at the other end of town - I made the start line with minutes to spare. The current course is a tough little race with 1800' feet of climbing over 5.5 miles - significantly more climbing than the original race, and more of a fell course. John Marshall was 103rd in 24:12 at Leeds Hyde Park. 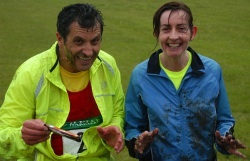 Gemma Carpenter was 51st in 26:47 at Lister Park, Bradford. Jann Smith reports ... My first proper off-road event, 2600 feet of ascent and a brutal head wind at first. Standing on the start-line with my newly purchased bum-bag containing; compass, whistle, waterproofs, map with course plotted by grid-references and emergency food I felt very out of my comfort zone. I learnt a few lessons during the race: 1. Don't wear road shoes! The terrain is very rocky underfoot being mainly limestone pavement. 2. Listen to Ewan Welsh's advice: 'take it really steady at the start', so why was I racing with the first lady for the first 8 miles?? 3. If in doubt, get the map out! Don't believe other people know the route, I took a couple of wrong turns and ended up running about an extra mile and a half in a full circle losing valuable time!! It's a great well organised race, the scenery was stunning and varied, everybody helped each around the course and it's on our doorstep...it's a real challenge, the hardest race I've ever done so far, but Graham Arthur, yes,I did enjoy it!! Clare Smith reports ... Several hardy Harriers turned out for this little toughie on Saturday. Certainly the hardest fell race I've ever done, just under 18 miles long and with about 7000ft of climb, including Harter Fell, Hardknott Fell, Little Stand, Swirl How, Dow Crag, White Pike and Caw. Helene Whittaker, Alison Weston and Nicky Jaquiery were 3rd ladies' team. Q: 'Have I reached the top of Little Stand yet? Alison Weston adds ... a tough race but also lakeland running at its best. Blue skies, great views, lots of up + down, and lovely running along soft, grassy terrain. Dave, Steve and Duncan all had super runs as did Helene, Nicky and Clare. I am pretty sure we won the ladies vets team prize. So we need to keep it up! Andrew Bennett reports ... This event was the culmination of a great week up in the Cairngorms staying at Mark and Rebecca Mon-Williams' cottage (details on the Forum). Upon arrival Tom and I were immediately drafted in as emergency marshalls due to a shortage of volunteers and found ourselves whisked off to staff the first water stop complete with two-way radios. Alison ran the race which took place on roads, rough tracks and hills around the Balmoral Estate. We managed to get back to the finish to see her come in as second lady in a time of 1:38:40. 10 Harriers enjoyed an excellent event - a sunny evening, a great venue, and a challenging race. Well done to them, but this was a shockingly low turnout and we cannot get good team results without much better support. Come on everyone, let's do better at the next race at Otley on 21st June. Dave Wilby reports ... Tom Adams produced a magnificent performance once again to lead all the way, winning by a good margin and pushing himself to within 2 seconds of Ian Holmes record which has stood for the last 10 years. In the last week Tom has now broken 2 course records, won 2 races outright and set the fastest leg in a relay, and collected a silver medal for his county, not bad going!! Nick Pearce & Jim Towers both won their age groups with strong performances and there were plenty of other Red & Green vests on show. A good showing by Ilkley at one of our local races.